Couch to 5k – I think the sunshine has gone to my head! 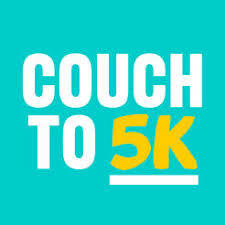 Couch to 5k has been on my mind for some time. Many of you will know that whilst I bang on a lot about how good exercise is for you, I haven’t always practiced what I’ve preached. I have learned all the excuses for not doing it from my patients over the years. For the past 14 months, I have been going to a personal trainer every week which has inspired me to do some exercise at home and use an exercise bike. Without a doubt, I am a lot fitter for it, and a little thinner. But, I reward myself with food, which means that the more I exercise, the more I feel that I ‘deserve’ that glass of wine or Ginger Nut! Below we discuss the most common pitfalls to be aware of when it comes to finding the causes and best treatments for Cycling Injuries. 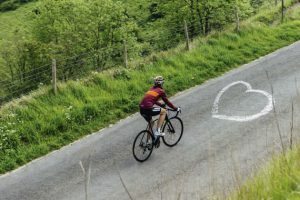 As keen cyclists always hungry to improve, we get our information from all kinds of places; other riders, magazines and the professionals we see on TV, but how do we know what we’re doing is right, and best for us personally? When it comes to Cycling Injuries, according to the experts, there are some commonly held misconceptions that could mislead us, the kind that we see here at Ashburton Physio most regularly when patients present with cycling injuries or pain which refuses to go away. Achilles Tendinopathy – what should you do? This is a subject close to my heart at the moment as I am experiencing symptoms. 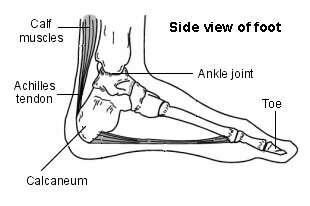 The Achilles Tendon can be found just above the heel bone, it attaches the calf muscles, Gastrocnemius and Soleus to the heel. Having poor training or exercising techniques – for example, a poor running technique. Making a change to your training programme – for example, rapidly increasing the intensity of your training and how often you train. Shin Splints or Medial Tibial Stress Syndrome (MTSS) is a common injury amongst runners. Like so many of the running injuries we see in clinic every day, Shin Splints is classed as an ‘overuse injury’. It does appear in other sports but is certainly much more prevalent in runners. In typical cases of Shin Splints, pain is usually felt two-thirds of the way down the shin bone (Tibia), just off the inside edge of the bone. In the early stages of the condition, pain is usually felt at the beginning of a run and then subsides during the training session itself. Commonly, symptoms also tend to reduce a few minutes after a run session has finished. As the injury gets worse the pain can be felt when walking and at rest. It is often painful when direct pressure is applied to the inside border of the tibia. Occasionally some swelling can be present. Frozen Shoulder is a common cause of shoulder pain, particularly within middle-aged patients. Indeed, in Chinese medicine, Frozen Shoulder is known as ’50-year-old shoulder syndrome’. It is also known as ‘Adhesive Capsulitis’ meaning a ‘Sticky Capsule’ and more recently is coined a ‘Contracted Frozen Shoulder’. It is slightly more common among females than males and is more likely to occur following an injury to the shoulder and is more commonly seen in patients with certain medical conditions such as diabetes. Often there is no cause or explanation for why a Frozen Shoulder occurs. Typically, Frozen Shoulder often starts slowly, with quite severe pain, often in the upper arm, which then develops into pain with severe stiffness and loss of range of motion at the shoulder region. Patients more often complain that they are having difficulty sleeping due to the pain. The loss of movement most often associated with a frozen shoulder affects the ability for patients to externally rotate their shoulder (turn their shoulder outwards) and therefore patients see a severe restriction of certain movements such as washing their hair or reaching their arm into their coat sleeve. Lower Back Pain (lumbago) is particularly common, although it can be felt anywhere along the spine – from the neck down to the hips. In the case of lower back pain, statistics show that 80% of the population have suffered from some complaint in this area. The scary statistic is that of this number, 80% of the injuries will reoccur within three years. Often the reoccurrence rates increase, eventually resulting in constant pain. In most cases, the pain isn’t caused by anything serious and will usually get better over time. Patients need to learn how to manage their symptoms to avoid the pain returning. This is where Physiotherapy comes into its own. Whether back pain rules your life or you just get an occasional twinge, physiotherapy should be able to help you, and hopefully, help recurrences. A Headache is a pain in the head due to varying causes. Headaches may result from any number of factors, including tension; muscle contraction; vascular problems; withdrawal from certain medications; abscesses; or injury. Cervicogenic or Neck-related headaches are the most recently diagnosed type of headache and are musculoskeletal in nature. They may be caused by pain in the neck or spine that is transferred to the head. Many times, neck related headaches go undiagnosed because of their recent classification. Tension-type headaches are the most frequent. Patients who endure tension-type headaches usually feel mild to moderate pain on both sides of the head. 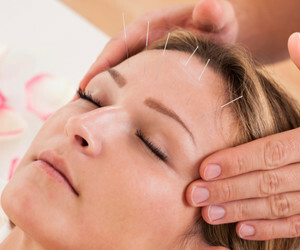 The pain is usually described as tight, stiff or constricting as if something is being wrapped around your head and squeezed tightly. Migraines affect far fewer people than tension-type headaches and have a much shorter duration, their symptoms are much more severe. They typically affect women more frequently than men, with pain that usually occurs on one side of the head. Migraines can be so severe that they can cause loss of appetite, blurred vision, nausea and even vomiting. Tennis elbow is a condition that causes pain around the outside of the elbow. It is clinically known as lateral epicondylitis and occurs following overuse of the muscles and tendons of the forearm, near the elbow joint. You may also find it difficult to fully extend your arm. Really proud to have witnessed our patient Sarah’s new project today. She had her second go in a ReWalk Robotic Exoskeleton and was amazing. She has really grasped the basics quickly and managed over 2000 steps. Sarah has already learned to stop, and change direction and has been designated Star Pupil status. ‘Bigger steps’ and ‘Faster’ comments already prove that her determination is outstanding. Uneven ground and slopes were a little more challenging but won’t beat her. Plantar Fasciitis /Heel pain is a common foot condition. It’s usually felt as an intense pain when using the affected heel. Heel pain usually builds up gradually and gets worse over time. The pain is often severe and occurs when you place weight on your heel. 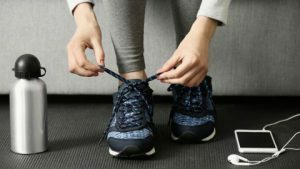 What is the Plantar Fasciitis? The plantar fascia is a tough and flexible band of tissue that runs under the sole of the foot. It connects the heel bone with the bones of the foot, and acts as a kind of shock absorber to the foot. In most cases, only one heel is affected, although estimates suggest that around a third of people have pain in both heels. Most cases of heel pain are caused when the Plantar Fascia becomes damaged and thickens. 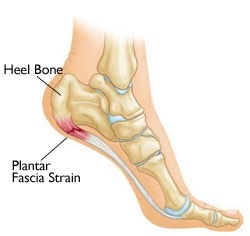 Plantar fasciitis is the medical term for the thickening of the plantar fascia. 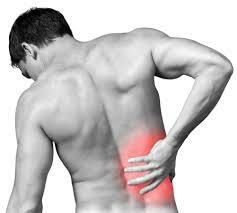 The pain is usually worse first thing in the morning, or when you first take a step after a period of inactivity. Walking usually improves the pain, but it often gets worse again after walking or standing for a long time. Some people may limp or develop an abnormal walking style as they try to avoid placing weight on the affected heel.